Stylish, hygienic, functional + safe, this is by far the best bird house you can get for your little feathered visitors! By providing the perfect environment for nesting or feeding, you will attract beautiful birds to your garden year-round. Winner of the 'Garden Product of the Year' award in Sweden in 2006, this unique bird house combines stylish Swedish design with ornithological knowledge, resulting in a product that is not only attractive, but also meets the needs of the birds and the environment. Made from solid wood, and painted in gorgeous designs, these adorable miniature houses feature fine detailing, such as little windows + a stylish front door. The Designer Bird House + Feeder is built to last, lovingly hand-crafted in sustainable and ethically logged wood from well-managed forests, and painted with environmentally friendly paints. Sturdy in construction and stylish in design, birds will enjoy this beautiful house for many years to come. Watch this short video of beautiful little birds enjoying the sanctuary and food of the Designer Bird House + Feeder. Bring your garden, balcony or courtyard to life by inviting beautiful feathered friends to come rest and feed in style! A combined nesting box and bird feeder, the Multiholk Designer Bird House + Feeder is built as a series of adorable miniature houses. Designed in Sweden along with ornithological experts, they are handcrafted from solid wood, and painted in gorgeous designs using environmentally friendly paints. These bird houses have been designed to be as functional as they are beautiful, to ensure that bird feed is protected from rain and snow, and that it cannot be contaminated by droppings. 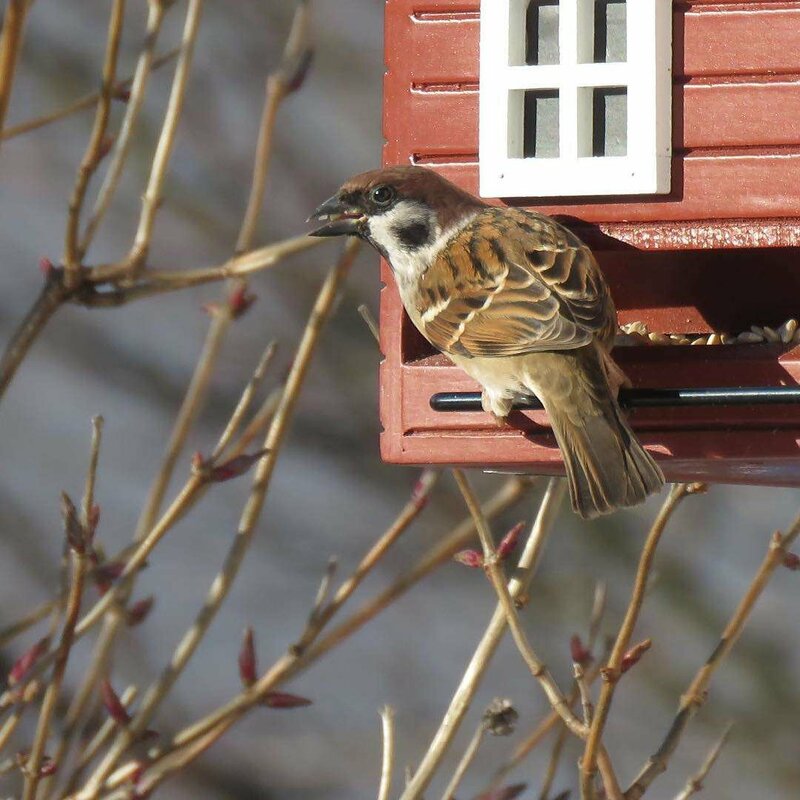 To further ensure hygiene, perches are placed at feed windows at the bottom of the house so that birds don't sit in the food (as they would with open platform feeders). Additionally, perches are kept narrow so that large birds such as crows are unable to land, allowing small birds to feed in peace. Suitable for mounting to a wall, tree or post, the Designer Bird House + Feeder comes with an integrated fixing bracket and screw, so you can install it with ease, and enjoy a garden filled with beautiful, magical birds in no time! 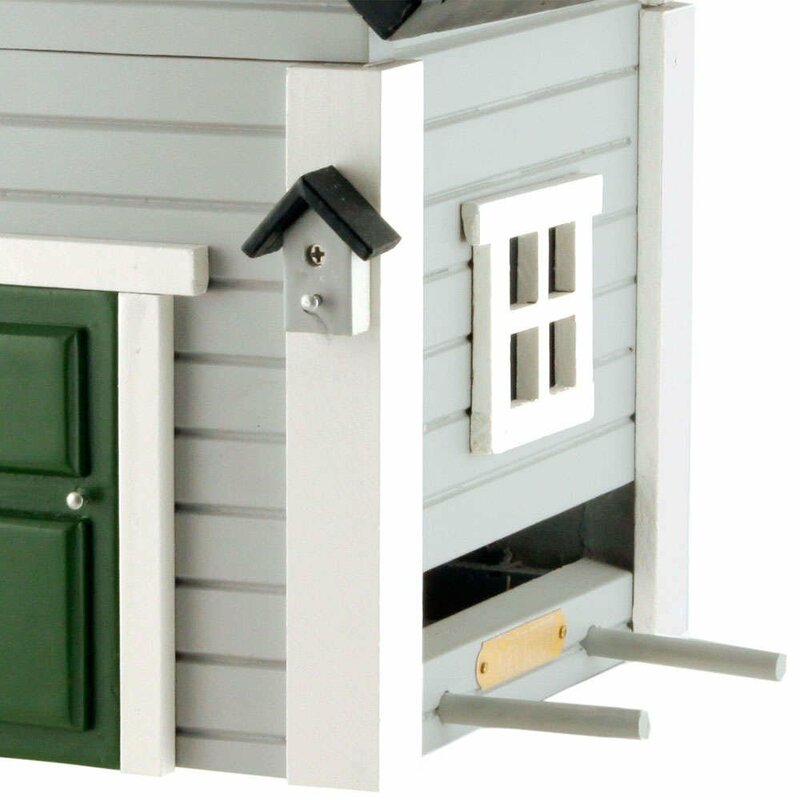 Adorable detailing, such as a charming little window, chimney, front door and even a little mini bird house! Responsible bird feeding Love your feathered friends? Be a responsible bird feeder by providing high quality food (such as sunflower seeds), rather than thinned out mixtures and human leftovers that are generally too high in salt or sugar for birds. Also, remember not to overfill your feeder - it should serve as a place for birds to visit and enjoy a snack, and isn't intended to be their only source of food. 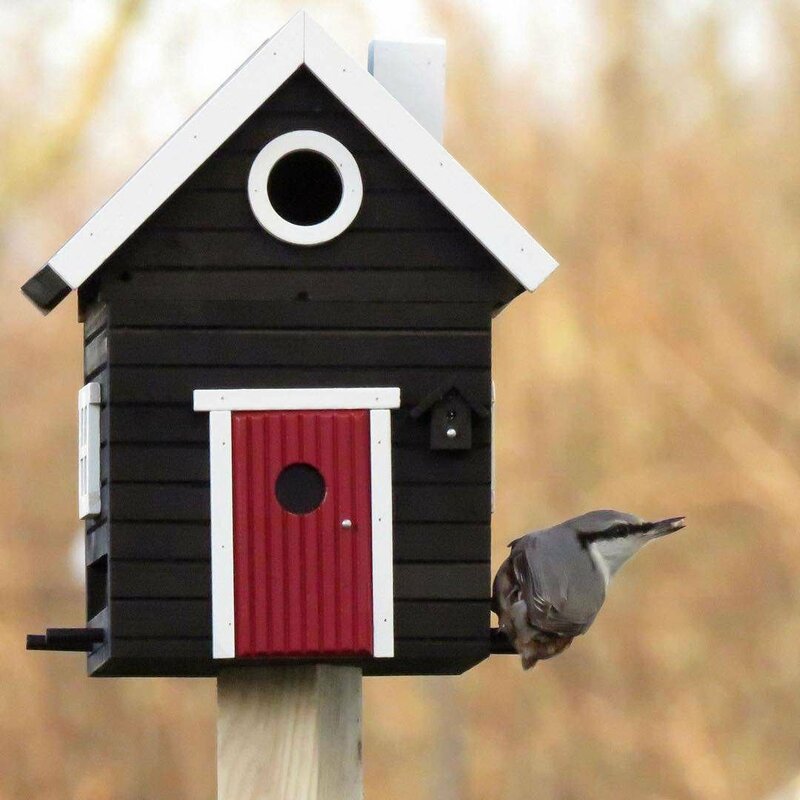 For hygiene reasons, always use a closed feeder, such as the Multiholk Designer Bird House + Feeder, and not an open platform feeder where birds can sit in the food and contaminate it with droppings. Providing a clean and safe environment for your feathered visitors will keep them happy and healthy, and bring them back to your garden again and again! Large birds This bird house has been designed for small birds only. If you see large and aggressive birds trying to access the feed or attempting to destroy the bird house, make sure you shoo them away, and consider moving the bird house to a different location.